Today we were supposed to be headed back to LBC to begin two rotations up the mountain and spend two nights on the summit which is at 20,000 ft, but between 6:00 am and 6:30 am, I was awoken in my tent from the loud distinctive roar of an avalanche. Now, because we are tucked into the end of the Khumba Valley, surrounded on three sides by mountains with a gap in between two of the mountains where the Khumba rolls down, avalanches happen every night. You learn to distinguish by direction where they are coming from. This one was definitely coming from the Khumba. I looked out my tent flap and could see what appeared to be a huge missing chunk from the massive 5 story glacier that like a sentinel, stood precariously perched over watching the narrow gap that is the Khumba Ice Fall. It didn’t take long to know something was happening as the radio chatter could be heard increasing in frequency and intensity. Our base camp was awakening like stirred up hornets nests. Our first question was what about our Sherpas? We call them “our boys” because most of them are in their late teens or early twenties. We knew many of them had gone up the Khumba that night. Our head Sidar, (the head climbing Sherpa in charge of our boys and who himself has summited Everest 21 times) quickly confirmed that all of our boys were well above the avalanche at Camp 2, already dropping off their loads. Our boys always head up the Khumba at 2 am when the ice is the coldest and most frozen and thus less likely to avalanche. As the tragic day unfolded and I watched from 100 yards away, 13 Sherpa bodies were being long lined from a helicopter one at a time, some listlessly dangling with arms and head bent backwards as if offering their chests to the sky, others in body bags. Slowly this rescue proceeded through the day as the helicopter would disappear deep into the Khumba only to return with another body. Then another. Then another. Later, when our boys returned, one of them told me what happened. Apparently about 1-2 hours into the Khumba (a Sherpa can get through in 2-3 hours, western climbers will take 4-6) two ladders that had been tied together and laid across a ten to fifteen foot wide crevice, collapsed in the place where they were tied together now forming a sunken v-shape. This created a traffic jam very similar to when a car accident happens on a freeway stopping traffic. It doesn’t take long for cars to back up, so too did the Sherpas. Quickly the single file line of Sherpas pooled into 25 or so all standing still attempting to navigate these broken ladders. As fate would have it, at this precise moment, at the only time probably all season when a malfunction in the fixed line up the Khumba would create a pool of Sherpas in this number, from 10 stories above, a massive block of the overhanging glacier let loose and causing the biggest single day loss of human life ever on Everest and ever in the history of the Himalayas. 13 dead and taken off the mountain. 1 more identified but unable to be retrieved that afternoon. 3 more missing but presumed dead. A total of 17 lives lost and 5 wounded. 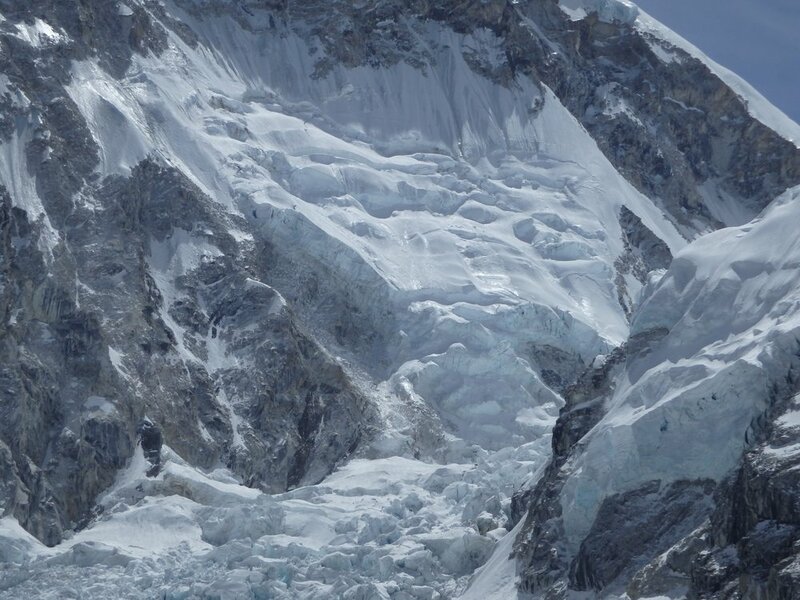 This was now the deadliest year on Everest…. and my turns through the Khumba loomed ahead. I remember the last time I went through and heard in the dark two avalanches rumble towards me only to peter out at my feet. The ballroom of fate. And after that it’s just the rest of Everest and 10,000 feet of elevation into the death zone.